LEXINGTON, KY (January 4, 2010) "Why did gorgeous horses like those need new homes?" is a question frequently asked by disbelieving park visitors about the stunning, black Arabian horses which recently arrived at the Kentucky Horse Park. An Arabian stallion and mare came to the park through a partnership with the Kentucky Equine Humane Center (KyEHC) and will soon go to work promoting the park's next international blockbuster exhibition, the $2.35 million A Gift from the Desert: The Art, History and Culture of the Arabian Horse, which will be open May 29-Oct 15 in the International Museum of the Horse. The horses will also be used to promote the new multi-million dollar Arabian Horse Galleries wing of the museum which will open this spring, and in the park's daily Parade of Breeds show. John Nicholson, executive director of the park stated, "Part of our mission at the Kentucky Horse Park is to educate the public about the horse and man's relationship to it. We are living in a time when that dynamic relationship is under tremendous stress due to economic challenges facing horse owners. The travesty of this crisis is that thousands of good horses are coming to the end of the line prematurely and will never reach the fullness of their life's purpose unless more people get involved in their rescue. "I am so proud that the Kentucky Horse Park and the Kentucky Equine Humane Center are on the redemption side of this story as we continue to invent ways to save horses' lives and give them enjoyable jobs that will enlighten and thrill literally hundreds of thousands of park visitors." Kathy Hopkins, equine director for the park said, "Black horses are not all that common, so when the Humane Center contacted us about these exquisite, well-trained, black Arabian horses who needed new homes, we immediately agreed to take them. As we share their stories with our visitors, we will have a perfect opportunity to help the public understand the importance of supporting equine welfare efforts." Lori Neagle, executive director of the KyEHC observed, "Our partnership with the Kentucky Horse Park has already exceeded our expectations in terms of the number of at-risk horses that we have been able to assist. These horses will also be great ambassadors for their breed and for equine adoption for years to come." Nicholson concluded, "The Arabian horse has been highly prized by many cultures throughout history, but in spite of that, like so many other breeds, scores of them are fighting for survival in perilous situations. I would strongly encourage the public to join the Kentucky Horse Park in supporting organizations like the Kentucky Equine Humane Center and others which are on the front lines, providing humane solutions." For information on A Gift from the Desert: The Art, History and Culture of the Arabian Horse go to: www.giftfromthedesert.com. For information on the new Arabian Horse Galleries wing of the International Museum of the Horse go to: http://www.purebredarabiantrust.com/Galleries_Info.asp. For information on the partnership between the Kentucky Horse Park and the Kentucky Equine Humane Center to rescue and rehabilitate injured and unwanted horses go to http://www.kyhorsepark.com/news.php?page=4&articleID=580&pageid=73§ionid=9. For information on the Kentucky Equine Humane Center go to www.kyehc.org. 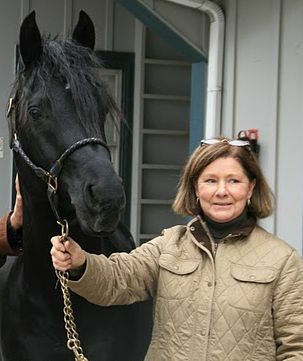 EDITOR'S NOTE: The photo above is of the new Arabian stallion with Kathy Hopkins, equine director for the Kentucky Horse Park. The Kentucky Horse Park is a working horse farm/theme park and equine competition facility dedicated to man's relationship with the horse. The park is an agency of the Kentucky Tourism, Arts and Heritage Cabinet that hosted nearly 900,000 visitors and campers, as well as 15,000 competition horses in more than 100 special events and horse shows in 2008. The park is home to the Alltech FEI World Equestrian Games and the National Horse Center which comprises more than 30 national and regional equine organizations. Located at Exit 120, Interstate 75, just north of Lexington, the Kentucky Horse Park is The place to get close to horses. Open daily March 15 to October 31, and Wednesday through Sunday, November 1 to March 14.